Jules Feiffer has won a number of prizes for his cartoons, plays, and screenplays, including the Pulitzer Prize for editorial cartooning. His books for children include The Man in the Ceiling, A Barrel of Laughs, A Vale of Tears, I Lost My Bear, Bark, George, and Meanwhile... He lives in New York City. "I have been writing and drawing comic strips all illy life, first as a six-year-old, when I'd try to draw like my heroes: Alex Raymond, who did Flash Gordon, E. C. Segar, who did Popeye, Milton Caniff, who did Terry and the Pirates. The newspaper strip back in the I 1940s was a glorious thing to behold. Sunday pages were full-sized and Colored broadsheets that created a universe that could swallow a boy whole. "I was desperate to be a cartoonist. One of my heroes was Will Eisner, who did a weekly comic book supplement to the Sunday comics. One day I walked into his office and showed him my samples. He said they were lousy, but lie hired me anyway. And I began my apprenticeship. "Later I was drafted Out of Eisner's office into tile Korean War. Militarism, regimentation, and mindless authority combined to squeeze the boy cartoonist Out Of me and bring out the rebel. There was no format at the time to fit [he work I raged and screamed to do, so I had to invent one. Cartoon satire that commented on the Lin military the Bomb, the Cold War, the hypocrisy of grownLIPS, the mating habits of urban Young men and women, these were my subjects. After four years of trying to break into print and getting nowhere, the Village Voice, the first alternative newspaper, offered to publish me. Only one catch: They couldn't Pay me. What (lid I care? "My weekly satirical strip, Sick Sick Sick, later renamed Feiffer started appearing in late 1956. Two years later, Sick Sick Sick came out in book form and became a bestseller. The following years saw a string of cartoon collections, syndication, stage and screen adaptations of the cartoon. One, Munro, won an Academy Award. "This was heady stuff, taking me miles beyond my boyhood dreams. The only thing that got in the way of my enjoying it was the real world. The Cuban missile crisis, the assassination of President Kennedy, the Vietnam War, the Civil Rights revolution. The country was coining unglued and my weekly cartoons didn't seem to be an adequate way of handling it. So I started writing plays: Little Murders, The White House Murder Case, Carnal Knowledge, Grownups. All the themes of my comic strips expanded theatrically and later, cinematically to give me the time and space I needed to explain the times to myself and to my audience. "I grew older. I had a family, and late in life, a very young family. I started thinking, as old guys will, about what I wanted these children to read, to learn. I read them E.B. White and Beverly Cleary and Roald Dahl, and, one day, I thought, I ley, I can do this." "Writing for young readers connects me profess sionally to) a part of myself that I didn't know how to let out until I was sixty: that kid who lived a life of innocence, mixed with confusion and consternation, disappointment and dopey humor. And who drew comic strips and needed friends--and found them--in cartoons and children's books that told him what the grown-ups in his life had left out. That's what reading (lid for me when I was a kid. Now, I try to return the favor." 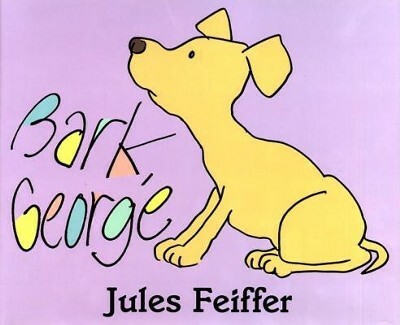 I'm the author/artist and I want to review Bark, George.